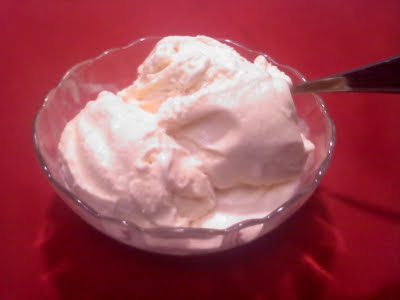 It's true that I like all kinds of ice cream, but when you get right down to it, vanilla is my favorite. Whenever there's a choice of vanilla or chocolate, I'm going for the vanilla. Even as a child waiting in line to buy a Mister Softee cone, I always picked vanilla. It's the basis for a perfect sundae. It's the go-to ice cream to serve on top of pies and cobblers. Pour a little caramel sauce on top and I'm in heaven! Heat the milk, salt, and sugar in a saucepan. In a separate bowl, whisk together the egg yolks and gradually add some of the warmed milk, stirring constantly as you pour. Pour the warmed yolk/milk mixture back into the saucepan. Cook over low heat, stirring constantly and scraping the bottom with a heat-resistant spatula until the custard thickens enough to coat the spatula. Strain the custard into the heavy cream. Add vanilla extract. Place bowl in the fridge until completely chilled. Freeze in your ice cream maker according to the manufacturers instructions. Transfer to a freezer safe container and freeze until firm. Cookies and Cream: Simply chop some Oreos or other favorite chocolate sandwich cookie. Heath Bar Crunch: Just as the name says, simply add chopped Heath bars or toffee bits. Cookie Dough - Mix up a batch of cookie dough (using pasteurized eggs or pasteurized liquid egg products). Roll dough into a log and chill until firm. Slice dough into wheels then cut each wheel into small pieces. Chocolate Chip: Chop up a bar of your favorite chocolate or simply use mini toll house morsels. Mint Chocolate Chip: it's the same as regular chocolate chip, but add about 1/2 tsp pure mint extract when you add the vanilla extract. You can also add a few drops of green food coloring when you stir in the chips, if you like. Fudge or Caramel Swirl: Place "soft serve" ice cream in freezer container. Pour caramel or fudge topping on top. Using a knife or spatula, cut through the topping all the way to the bottom of the container and then swirl back up to the top. Do this only once or twice more. It works much better when your container is more shallow than tall. When I began testing different ice cream recipes, I discovered that I prefer those recipes which include eggs in the base. (Technically, this makes it a custard, btw). I found that the eggs make the final product richer and creamier. You can use a vanilla bean instead of the vanilla extract. Using a sharp knife, split the bean lenthwise, and then scrape out the tiny seeds inside. Add them to the other base ingredients before heating. You can add the bean pod to the mixture as well, but just remove it after the mixture thickens.